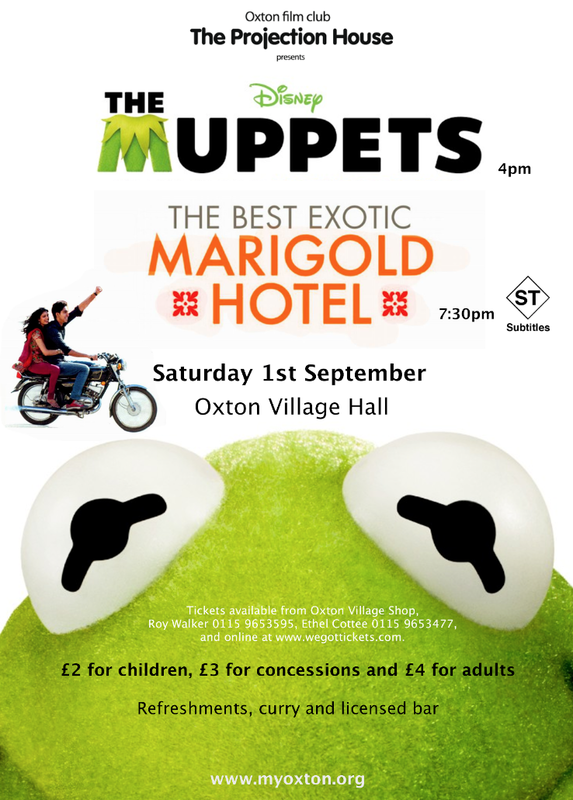 The Oxton Projection House are returning on Saturday 1st September with two colourful comedy blockbusters to help you forget the soggy summer weather. First up is The Muppets (U), last year’s successful return of the felt-based franchise, featuring a star-studded cast including Jason Segel, Amy Adams, Kermit, Miss Piggy and the whole gang. In an Oscar-winning film that will appeal to all ages, the Muppets reunite with the help of three fans to save their old theatre from being redeveloped. That’s followed by The Best Exotic Marigold Hotel (12A), a highly-acclaimed comedy drama starring the cream of creaking British acting aristocracy including Maggie Smith, Judi Dench and Bill Nighy. It tells the story of a group of retirees who travel to India to take up residence in what they believe is a newly restored hotel. Less luxurious than its advertisements, the Marigold Hotel nevertheless slowly begins to charm in unexpected ways. As an added inducement to enter into the spirit of things, children are invited to bring Muppets, puppets and toys with them, and curry, naan bread and Indian beer will be on sale in addition to the usual popcorn, snacks and drinks. As ever, the films will be shown on a large brand new screen with a superb sound system in the comfortable surroundings of Oxton Village Hall. Please note that the screening of The Best Exotic Marigold Hotel will include subtitles. Doors open at 3.30 pm and the first film will be shown at 4.00pm. Doors open at 6.30pm for the second film which is shown at 7.30pm. Tickets cost £4 per film, £3 for concessions and £2 for children. Tickets are available in advance online from www.wegottickets.com, from Oxton Village Shop, and Ethel Cottee on 0115 9653477 or Roy Walker on 0115 9653595. Tickets on the day will incur an additional cost of £1. another fab offering to enjoy right here on our doorstep – can’t wait! thanks. is having a film with sub-titles an option? a local friend’s daughter is deaf and say it is practically impossible to (a) find good films at (b) ‘normal’ viewing times at (c) local cinemas for her/her friends and the family to enjoy together. the induction loop system thingy doesn’t really work as sounds can vary and be muffled – hence the need for sub-titles. She’d love to come and see the Muppets etc if it were possible. Let me know and I can feedback. Thank you. Further to my enquiry above, having sub-titles for the Marigold hotel film would be the one my friend’s daughter and family and friends would love to see together (as bit old for the ‘Muppets’ now). Interested to know if this is possible. No one is ever too old for the Muppets! Anyway, yes, the film group’s intention is to now show The Best Exotic Marigold Hotel with subtitles, and it will be advertised as such. Thanks – that is great news. remind me of my kids).